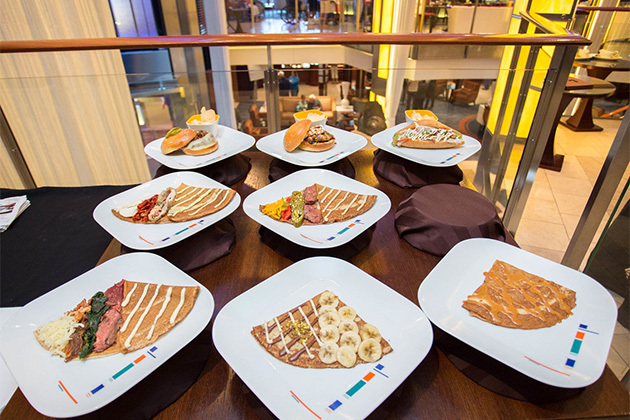 The second ship to debut in Celebrity Cruises' Solstice class (after Celebrity Solstice), Celebrity Equinox has many charms -- grass lawn, glass-blowing shows and a variety of craft cocktail bars. In order to make the most of your vacation onboard Equinox, follow our five pro tips. Tip 1: Take care of dining on the first night. It's also prudent to address dietary restrictions, like gluten intolerance, on the very first night onboard -- even if you've indicated it in your docs online before your cruise. Be sure to let your maitre d' or guest relations desk know early on in the cruise if you have an allergy or any other dietary consideration, and it should carry with you throughout your sailing, no matter which restaurant you are dining at. In Silhouette, the main dining room, ask for the following night's menu the evening before to make any special orders or changes. Additionally, gluten-free pancakes or waffles are a possibility for breakfast with advanced notice. Tip 2: Sit front row at the production shows. 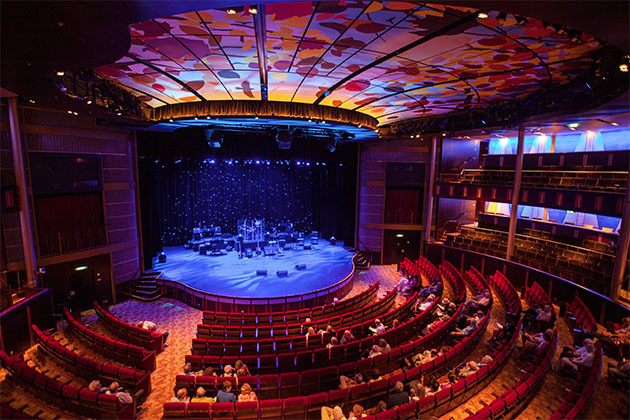 You might be used to sitting in the back and slipping out during the theater show on your cruise, or setting yourself up somewhere in the middle so you can flag down a waiter for a drink order, but on Equinox, we encourage you to arrive early and sit front and center for at least one of the stage productions. 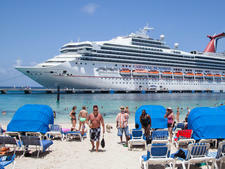 Unlike other cruise lines, Celebrity encourages audience members to photograph and record its shows (without flash), and share those experiences on social media. The shots you will get of frivolously costumed dancers or aerial performers gliding right above you are worth the proximity. Tough to get those front-row bragging rights (or photos) with a Broadway show. We found you could easily get these prime seats by showing up about a half-hour to 20 minutes before showtime. Tip 3: Get sushi to go, and have a picnic on the top-deck lawn. Sushi, sashimi and nigiri are available for takeout during lunch and dinner hours from casual Asian restaurant Sushi on Five. Order it for delivery to your stateroom, or pick it up on your way to the Lawn Club on Deck 15 (call extension 51 to order). Grab some towels from the pool, some free dessert from the Oceanview Cafe and that bottle of wine you have hanging around your cabin and create your own perfect picnic on the grass lawn that covers the top deck of the ship. (Not a sushi fan? 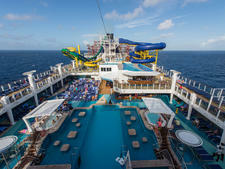 Grab a plate of fruit, cheese or another snack from the Oceanview Cafe one deck below.) Even better if you can time it to coincide with one of the Corning Museum of Glass shows or a musical performance at the Sunset Bar, just at the back of Deck 15. 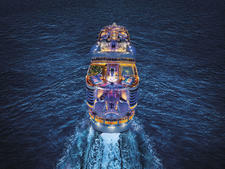 Tip 4: Go to the Silent Disco; it's the most fun you'll have all cruise. We were skeptical about the Silent Disco -- a dance party where participants wear headphones and dance to one of three stations -- but it is probably the most fun you can have on a cruise ship. Cast away your doubts that it will be forced and awkward; turnout is high and you'll see young and old grooving on the dance floor of Quasar nightclub to the literal beat of their own rhythm. (Past passengers talked the event up on the first day and other passengers recounted it for nights afterward.) The color of your headset changes with the station -- ours was green for oldies, red for Latin and blue for modern club hits -- and it's a total blast to see people switch around or try to turn the tide. Take your headphones off for a moment and hear the impassioned and ever-so-slightly out-of-tune sing-alongs to "Do Wah Diddy Diddy" or suddenly see arms overhead motioning out YMCA. The event is typically timed well to coincide with the end of the second theater show and as the crowd spills out into the atrium, passersby can't help but don a pair of glowing headphones. (These same headsets are used for occasional free, early-morning guided meditation on the Lawn Club.) In fact, the Silent Disco was so popular on our sailing, they added another in the Solarium toward the end of the cruise. Tip 5: Grab cocktails at the coffee shop. Cafe al Bacio is an unlikely but pleasant venue for a pre-dinner drink; bustling during the day, the atmosphere is still as enticing -- but way less crowded -- at night. 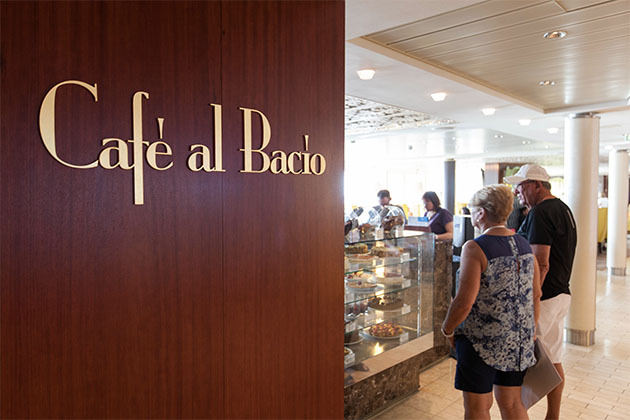 This coffee and pastry shop is nestled right in with other popular venues around the atrium on Deck 5, which means evening music from the ensemble still floats up and you feel like you're in the mix, but not elbowing other passengers like you might be at the Martini Bar. Plus, who says a slice of complimentary chocolate cake isn't the perfect companion to your glass of red wine? Bonus tip: There are plenty of other nooks (if you know where to look). If you're the kind of couple that wants to feel like you have the ship to yourselves, check out some other romantic hideaways nestled around the ship. For great views, we suggest taking your drinks just outside of the Sky Observation Lounge to the two chairs near the elevators behind a metallic art piece that serves as a makeshift wall -- you'll have a giant window just for two. For your own private view of the wake (if you didn't score an aft cabin), there is a little nook between the Sunset Bar on Deck 15 and the Oceanview Cafe alfresco seating on Deck 14 -- there are cushioned chairs with tables for sunset drinks, snacks or even dinner. 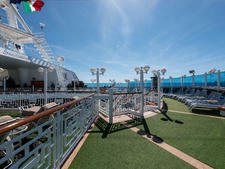 More nooks include the Deck 11 level of the library and cabana-like hammocks on Deck 12 near the Solarium.